Finally here we are with the long awaited latest and Best Skagen Watches Reviews. Skagen watches has been taking the world by storm in recent years with their signature Danish inspired design known for its minimalistic slim and refined mid-range watches. Traditional Scandinavian style is simple, clean, streamlined, cheerful and most importantly sustainable for any budget. Noticable how in recent years companies like IKEA have come out of no where to become global leaders with this type of styling concept. How good are Skagen Watches? 1 How good are Skagen Watches? 2.1 How long is the Battery Life for the Skagen Hybrid SmartWatch? 6.1 What is the History of Skagen Watches? 6.2 What do watch forums say about Skagen watches? 6.3 Where are Skagen watches made? 6.4 How is the Warranty of Skagen Watches? 6.5 What’s the Price range for Skagen Watches? 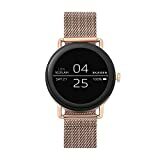 6.6 Do Skagen have Smart Wearables tech watch fitness tracker technology? 6.7 Are Skagen watch bands inter-changeable? 7.3 Sleekness: How slim are Skagen watches? 7.4 Weight: Are Skagen watches lightweight? 7.5 Bezel: Do Skagen watches have a bezel? 7.6 Luminous hands for dark/night: Are Skagen watches good for evening wear? 7.7 Closure: What type of closure do Skagen watches have? 7.8 Customizable to fit: Are Skagen bands easily adjustable? 7.9 Date /Calendar: Do Skagen watches also have a calendar for date and time? 7.10 Size of dial: What size watch dials to Skagen use? 7.11 Skagen waterproof watch: Are Skagen watches waterproof? 7.12 Ease of cleaning: How easy are Skagen watches to clean? 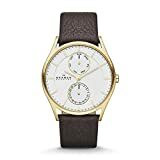 7.13 What is the Skagen watch Price range? 7.14 How to take care of your precious Skagen Watch? Skagen watches have done really well with the brands famous minimalist Scandinavian design. Good design is not easy to incorporate into every watch that comes out of any stable. Nevertheless Skagen watches have managed to do just that. Yes they are one of the very few “fashion watches” brands that have won multiple Red Dot awards for timepiece design. Most reviews of Skagen watches testify that Skagen watch buyers are regularly complimented for the minimalistic styling of their watches. Whats more is that they are also very comfortable to wear and easy to maintain. Our reviews for Skagen watches revealed that most Skagen timepieces use quartz movements in stainless steel cases. Yes there are also extremely lightweight and tough titanium collections as well. The watch bands tend to be designed featuring bracelets, Milanese bands, leather straps and NATO style straps. One of the most common complaints about Skagen watches is that the crystal glass sometimes tends to develop cracks over time. This is due mainly to the slim minimalistic designing of many models. This is just part of normal wear and tear especially when the timepieces are worn 24/7 on a long term basis. Furthermore our reviews suggest that the online consensus is that the average Skagen watch will last from about 1 to 3 years, which is pretty much the norm for most fashion watches in terms of lifespan. The high-end Skagen watches collections may well last even longer. Obviously this depends on how often you wear your watch and how you take care of it. Click the product star ratings to view trusted user reviews. The Best Hybrid and fully fledged Smartwatches have now got serious competition with the Skagen Hybrid Smartwatch collection. The hybrid smartwatch is a practical and stylish fusion of both Smartwatch and traditional watch. By using the outwardly outstanding beauty and timelessness of classic style watches married with the inner oceans of technology of the world of smart watches, a new breed of watches has evolved. Yes the fusion or if you like marrying of these two technologies has been instrumental in the evolution of modern day timepieces. That eloping of the two genres in the watch industry has led to the evolution or if you prefer the “giving birth” to the Hybrid Watch. In reality The Hybrid Watch encompasses elements of each world and can not be termed as a purely classical watch as they are generally not mechanical but inwardly digital in nature. However Hybrid watches can never be like smartwatches as they have sacrificed much need space and presentation space on the watch dial to being like a watch of the bygone era of classical watches. The Skagen Hybrid is no exception to this rule but having said that In the meantime the Skagen Hybrid has started from humble beginnings to now being a very useful albeit in a limited range, a very and practical classical Skagen Hybrid Smartwatch. Yes we can now be attatched to the modern world of messaging, alerts, emails, music remote controlling and activity monitoring for example whilst looking very sombre and timeless at the same time. Quite amazing really! Now it is not easy to tell whether the person you are speaking is “well connected” and taking the information flow on the chin as it arrives or is he disconnected from the so called information highway and liveing a very slow and measured pace of life. Taking time to place his every footstep with stability and in harmony with the physical around. The Skagen Hybrid Watch allows us to live in both worlds simultaneously. Yes admittedly only to a certain degree in each world due to the limitations in time and space! How long is the Battery Life for the Skagen Hybrid SmartWatch? It is well worth taking a look at the Skagen Hybrid watch collection which has distinct advantages ofver a fully fledged smartwatch as for example the battery can last for up to 6 months using a normal watch battery whereas for example the Skagen Smartwatch know for its fully fledged designation as a smartwatch has to be re-charged within 24 hours or less due to its massive energy consumption. 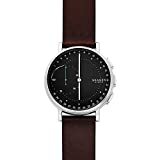 The Skagen Hagen SKT1101P Connected Hybrid Leather Smartwatch also known as the Hagen Connected Skagen hybrid smartwatch is a pioneering masterpiece. It is an amazing fusion incorporating the best of wearable tech of sports watches with the timeless beauty and elegance of a classic watch. By simply connecting your Hagen connected Leather hybrid smartwatch to your Android™ or iPhone® and the SKAGEN app, discreet and filtered notifications are received when you receive an incoming text, email or call. The Skagen Men’s SKT1101P Hagen connected leather hybrid smartwatch automatically updates itself to the correct time and date whilst running on a standard replaceable CR2430 cell battery. Additional features include: sleep and activity tracking facility, phone finder, music control, and much more. The beautiful leather strap can of course be easily replaced or interchanged with other 20mm straps. A perfect gift for your loved one now available for sale at the lowest online store price with Prime Free Shipping subscription options. Press the following link for a more in depth review for the Best Skagen Hagen Connected Watch Review. The Skagen SKT1202 Jorn Men’s hybrid smartwatch also know as the Skagen Jorn is a solidly built and easy to use “Hybrid Smartwatch.” The watch integrates the functions of a smartwatch and a fitness tracker within a traditional looking watch face. The beautifully designed classic watch face is connectable to the Skagen App as well as to other apps. Interestingly the Jorn hybrid smartwatch by Skagen runs on a standard watch battery and will last up to 6 months depending on use. The watch features the very simple and discreet smartwatch fitness and activity tracking functionality. The Diameter of the watch dial is 41mm, so very wearable for most. The watch band width is 22mm. Water resistance is just 30m, so despite it being a fitness and activity tracker, is is NOT a suitable watch to take into the pool with you. The Men’s Skagen Jorn watch is perfect for the home, office and boardroom where discreet message notifications with light vibration and watch hands pointing to the designated contact position alert what type of message has been received and from whom before returning to the time. Your music and more can be controlled with the customizable buttons on the side of the watch, as well as date check the date and controlling your camera shots. Can you imagine that it is also possible to set it so it makes your phone ring with the touch of a button. No longer will you have to talk to people you don’t want to! The Skagen Jorn also has sleep and activity tracking features calculating calories burned with the help of the app. This lovely watch can be easily paired as a gift with the Ladies version known as the Skagen Hald. Overall, the Jorn is a really decent watch that does a lot for the Skagen sale price, all while looking pretty damn good. Although the functionality could be improved it still is a really nice multi functional hybrid smartwatch fit for many standard everyday situations. Read more in detail about the Men’s Skagen Jorn Connected Hybrid Watch Review with the product link. This nice watch is a perfect gift for him that man in your life, now available for sale at the lowest online store price with Prime Free Shipping options through our offer links. The Skagen Men’s SKT111 Signature Connected Hybrid Smartwatch from Skagen has “cracked it” with the fusion of both innovative watchmaking and information technology with classic design and functionality. The Skagen Signature watch range is a well built and easy to use “Hybrid Smartwatch” collection. Skagen have produced a watch with the functionality of a basic smartwatch and fitness tracker married together within a traditional watch face. The classic looking analog watch face has a rather sporty look and feel to it with its stainless steel case and number dial layout. The watch connects to the latest iOS and Android apps for increased functionality. Great to know that your hybrid smartwatch battery will last a good 6 months depending on how you use it. The Signatur Connected hybrid smartwatch is always on it, syncing to your phone via Bluetooth technology. The Skagen hybrid range of smartwatches have the usual built-in activity tracking, custom filtered email, message and phone call notifications as well as automatic time and date adjustment. Notifications are received followed by light vibrations and the watch hands pointing to the custom designated “contact” positions before reverting back to the time. It is easy to track your everyday activities including steps walked, distance, and calories burned as well as monitoring your sleep duration and quality. The diameter of the watch dial is 42mm, so it is comfortably wearable for most. The watch band width is 20mm and water resistance is just 30m, so despite it being a fitness and activity tracker, it is NOT a suitable watch to take into the pool with you. Overall, the Signature Watch collection by Skagen Watches is really nice, offering stylish and well built hybrid smartwatches with great value for your hard earned money. Compared to other watches it seems like the Skagen sale price is quite reasonable when comparing like for like. Although the functionality as always could somewhat be improved, no doubt this hybrid smartwatch is still a really cool timepiece suitable for normal everyday standard requirements. Read more in detail about the Men’s SKT1111 Skagen Signature Connected Hybrid Watch in the product box. This watch is a perfect gift for him, that wonderful man in your life now available for sale at the lowest online store price with Prime Free Shipping options through our product box. This beautifully styled Skagen Hald Gray Leather Hybrid Smartwatch SKT1207 is definately for the ladies. Upon first glance like a traditional classical women’s watch but upon closer examination it is clear that there is alot more to this Best Skagen hybrid Smartwatch Review. The SKT1207 is the first Skagen wearable designed exclusively for the Ladies and the slimmest to date, measuring only 40mm in diameter, with 10mm in thickness and having a 20mm width watch band. The Ladies Skagen Hald Connected hybrid smartwatch incorporates a useful range of smart features within the body of a classic and traditional looking hybrid smartwatch. No need to ever charge the watch battery or wind up its crown. Simply replace the watch battery after around 6 months (depending on use). The main hybrid smartwatch feature is built-in with Bluetooth 4.1 (low energy) using the latest Android and iPhone compatible SKAGEN App. Features include activity tracking, filtered email, text and phone call notifications which are discreetly communicated with vibrations and the pointing of watch hands to customised settings specific to pre-set contacts. Easily monitor and analyse your everyday physical activities including steps taken, distance travelled, the amount of calories burned and last but not least the amount of sleep as well as sleep quality. The watch cleverly syncronises to your smart phone benefitting also from automatic time and date adjustment. A perfect gift for her, the woman in your life, now available for sale at the lowest online store price with Prime Free Shipping options through our offer links. For the ladies we have this beautifully styled Skagen Signature T-Bar Hybrid Smartwatch in Rose Gold. This Signatur T-Bar Skagen Hybrid Smartwatch incorporates a range of wearable smartwatch features in the body of a tradional classic watch. By connecting the smartwatch via Bluetooth 4.1 (low energy) to your Android or iPhone alongside the SKAGEN app, automatic updates will correct time and date as well as send you discreet text, email and phone call notifications. This cool watch runs on a standard replaceable CR2025 coin-cell battery which usually lasts around about 6 months (depending on usage) and continually keeps automatically syncronizing to your phone. This Skagen Hybrid Smartwatch known as a Tech Wearable weighs in at 9.8 oz and is designed exclusively for the Ladies. This is Skagen’s slimmest to date, with a range of smartwatch features that will diligently track your daily activities including steps, taken, distance travelled, calories burned and monitor your sleep duration as well as the quality of your sleep. By connecting the Skagen Hybrid Smartwatch to your Android device or iPhone via the SKAGEN app, the watch will send discreet, custom filtered smartphone notifications whenever a text, email or call is received. This is achieved by vibrations and movements of the hour hands to move to designated settings before reverting back to the current time. A perfect gift for the lady in your life, now available for sale at the lowest online store price with Prime Free Shipping options through our offer links. The Skagen SKT1205 Skagen Hybrid smartwatch is Skagen’s first wearable designed exclusively for the Ladies in the world of elegant fashion. Perfectly designed having only a 10 mm case thickness, the Skagen Hald Connected hybrid smartwatch has an enviable range of smartwatch features within the body of an outwardly classic watch. With a battery life of up to six months there is no headache to re-charge all the time! This hybrid smartwatch features built-in activity tracking with filtered notifications, and automatic time and date adjustment. You can also use the Skagen hybrid watch to snap a photo, ring your phone and control your music and much more with the customizable Skagen link button. Easy to track your everyday accomplishments including steps walked, distance travelled and of course calories burned. Whats more you can also monitor your sleep duration and quality of of sleep. A gentle buzz alert lets you know right away that a new notification or for an important text, email and app update has arrived. This fashionable and beautifully designed Skagen Hybrid watch is amazingly always on, always connected and automatically syncronising to your phone. Compatible with phones running Android OS 4.4+ or iPhone 5/iOS 8.2+. A perfect gift for ladies, now available for sale at the lowest online store price with Prime Free Shipping options through our offer links. Read the in-depth full review about this truly essential Best Skagen Women’s SKT1205 Review. Skagen have recently come out with a more fully fledged Smartwatch, the Skagen Falster and more recently with even more SmartWatch functionality with the Skagen Falster 2 smartwatch. The Skagen Falster 2 Smartwatch is a unisex smartwatch. A fashionable unisex smartwatch par excelllance. A great choice to compliment a contemporary lifestyle where we are all connected to one another through various types of smart devices in the work place, in public spaces and in the home. The Skagen Falster 2 SmartWatch is a beauty for the eye exemplifying its exceptional and renowned Danish Design. The Skagen Falster 2 SmartWatch’s slim minimalist good looks scores well when compared to other smartwatches. However as with most smartwatches the battery life has much to be desired for as it needs to be continually re-charged every 24 hours or so just to keep the show rolling so to speak. Smartwatches need loads of energy to continually sync with various apps downloaded and from the internet. Yes the Skagen SmartWatch is no exception and needs continual re-charging. Even every 18 hours or so depending obviously on the use. The Skagen Falster 2 fits in remarkably well with the needs and requirements of the modern world. You can click the link for a more in depth review for the Best Skagen Falster 2 SmartWatch Review. Here is the Skagen SKT5002 Falster smartwatch with 42mm Rose Gold steel case, 20mm Mesh watch band and to ch screen round mineral glass dial. The Falster Smartwatch is designed for use by both men and women and comes with the latest smartwatch interactive touchscreen features. Such features include a nice range of smartwatch features powered by Google Wear OS including: Google Assistant, smartphone notifications, activity tracking, world time, weather and much more. The Falster includes a number of functionality based theme displays to facilitate easy access to your favorite features as well as being able to add your favorite third-party apps from the iOS App Store or Google Play. Take advantage of the interchangeable straps having compatibility with all SKAGEN brand 20mm straps. Easily re-charge your Falster smartwatch for up to another 24 hours using the inductive charging magnet included in the packaging. Obviously this depends on usage of the watch in order to achieve 24 hours of usage. The Falster is compatible with the latest Google Wear OS and iOS and Android OS. All devices use Bluetooth 4.1 low energy and Wi-Fi 802.11 b/g/n. Like most smartwatches the Skagen Falster takes care of call info, texts, emails, calendar events, etc. It comes with 8 Skagen watch faces to inter change as required, but you can also upload and use faces from the Google Play store if need be. The Skagen Falster does last just a tad longer than other smartwatches. My previous watch would occasionally get down into the 9% range by evening. This watch is still at 65% when I’m going to bed. Not bad. Obviously this depends on your particular usage. The only “cons” for ther Skagen Falster SKT5002 tested so far are that it has no internal speaker so if you want to use the watch as a timer or alarm it will only vibrate at the appointed time. Also the Falster range of smartwatches from Skagen Watches has water resistance to only 33 feet so would not be suitable for any water related activities but should survive normal everyday splashes. A perfect gift for your loved one, now available for sale at the lowest online store price with Prime Free Shipping options through our offer links. Click to read more detailed Skagen SKT5002 Falster Rose Gold Steel Mesh SmartWatch review. Skagen watches have developed a unique and stylish minimalistic watches for men which have apparently stood the test of time a little longer than most fashion watches in this price range. Normally fashion watches come out of favour with a season or two. On the other hand Skagen watches and particularly their Men’s watches offer exceptionally enticing design and styling possibilities for the man about town to add that extra little touch to his outfit help make it stand out from the crowd. Take a look at our latest listings to see how Skagen watches for men are doing with reviews and Gift Sale listings. Skagen men’s watches are the perfect gift for your beloved and most cherished man, perfect for a stylish cool, calm and intelligent man. We have included links to the best places online to purchase your newest Skagen watch at the lowest price online and with Prime FREE Shipping available for your added convenience. The Skagen SKW6104 Men’s Ancher Black Leather Watch proves that the elegance and class of leather never goes out of trend. Along with the slimness of this watch, the leather strap helps make this watch a masterpiece for the low price of this watch. The black dial surface and the matching black calfskin leather band with buckle raises the style stakes of this watch to the next level. Time indices are denoted with sleek silver bars along with a small date window. 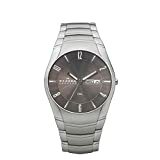 The Skagen 531XLSXM1 Men’s Laurits Stainless Steel Link Watch is another excellent wrist timepiece that is rightly priced considering its awesome looks and comfortable feel. It is scratch resistant and stays just like new due to the superior quality mineral dial glass used. If you like thin and lightweight watches, Skagen Men’s 531XLSXM1 Laurits Stainless Steel Link Watch will fit your taste perfectly. 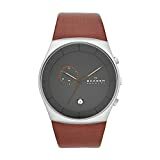 The Skagen SKW6237 Men’s Holst Dark Brown Leather Watch is a contemporary and stylish, sleek and minimalistic watch from Skagen that looks the part. It is guaranteed to attract the attention of today’s young hipsters. It is a gorgeous watch that will fit any wrist without causing discomfort or stress. It’s blue sunray dial face and the dark brown leather strap is an unusual blend of colors but exhibit a sense of elegance, well appreciated by admiring onlookers. Its appearance is enhanced with its slim baton like hands that sweep past elegant baton like hour markers. The Skagen Men’s SKW6237 Holst Dark Brown Leather Watch is sleek and smooth to wear and can be easily secured with its sturdy clasp. It is waterproof enough to handle a quick dip in the pool or light rain showers. However you should not wear it while snorkeling or diving. You will fall in love with this beautiful watch which has gained a decent following of trusted user reviews which can be viewed by clicking through the star rating image in the product box. A perfect gift for the man in your life. Now available for sale at the lowest online store price with Prime Free Shipping options. Read more details for the Skagen SKW6237 Holst Watch Review. The Skagen SKW6085 Men’s Havene Saddle Leather Watch is an analog watch which gets its amazing looks from a gray numberless dial, an elegant date window and a well-placed sub-dial. With its leather calfskin watch band and simple lightweight bulkle clasp comfort is assured. Fortunately the watch glass is completely scratch proof and the watch can be taken for a quick dip into the pool or other surface leisure activities in the water like fishing, boating or kayaking. Not suitable for diving or snorkeling though. The magic created with the good looks of this watch is due to the perfect use of colors. The hands of the watch are given a majestic copper hue. The hour and minutes hands have an enchanting white glow going down towards the watch center. The brown leather band of the watch gives the final touch to its beautiful and elegant appearance. The stopwatch function is again a thoughtful addition to this masterpiece from Skagen. Really nice reviews can be individually viewed by clicking through the star rating image in the product box. This watch gets an enviable position amongst the top mens watches from Skagen Denmark. A perfect gift for him now available for sale at the lowest online store price with Prime Free Shipping options through our offer links. Click to read the in-depth Skagen SKW6085 Havene Watch Review. The Skagen SKW6066 Men’s analog watch gets its amazing looks from a gray numberless dial, date window, and a well-placed sub-dial. With the leather calfskin and a convenient buckle to clasp this watch is both comfortable to wear and pleasing to the eye. The watch glass is completely scratch proof and the watch can be worn for occasional swimming and leisure activities like fishing, boating or even kayaking. The enticing good looks of this watch is created with the perfect use of colors. The hands of the watch are given a majestic copper hue. The hour and minutes hands are enhanced in appeal with a white glow going down towards the watch center. The brown leather band of the watch is the final touch to its excellent appearance. The stopwatch function is again a thoughtful addition to this value for money masterpiece from Skagen. 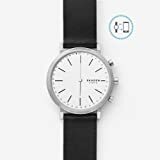 This is yet another Skagen men’s watch with great user reviews viewable individually by clicking throug the star rating image for this top Skaken timepiece. This is another Skagen watch for the Skagen Top 10 watches list for men. A perfect gift for him now available for sale at the lowest online store price with Prime Free Shipping options through our offer links. The Skagen SKW6108 Men’s Ancher Grey Mesh Watch exhibits perfection in stylistics with minimalist design characteristics fitting in to contemporary trends. This Skagen Men’s SKW6108 Ancher Grey Mesh Watch is another Skagen wonder fit to be envied. A look at this deep grey watch will take your mind into another world of appreciation in the fantasy and design of its creators. The mesh strap with a clasp buckle completes the elegant look. The hours are divided with simple silver bars and the calendar date is a useful reminder for impending appointments. This watch has a robust construction which is resistant to rough usage. It’s a flat watch that blends in with your wrist whilst “instinctively” slipping under the cuffs of casual and formal wear. Even with daily wear you will hardly find any fading of the steel metallic watch strap. Skagen uses a glass of superior quality that resists all kinds of scratches whether you a daily traveler, an active sportsman or a working professional. Yet again another favourite of watch buyers with great actual trusted user reviews (checkable by clicking the star rating image) for this watch. Another one of those Skagen watches for men which make the mark. You can trust the decision of many others like your self who respect elegance within simplicity od design. A perfect gift for that man in your life now available for sale at the lowest online store price with Prime Free Shipping options through the product offer links. Click through to read the in depth latest and Best Skagen SKW6108 Ancher Mesh Watch Review. 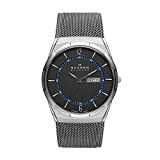 The Skagen 233XLTTN Men’s Grenen Grey Titanium Mesh Watch is a sturdy blue dial watch that looks dynamic and trendy. The navy blue dial is enclosed within a titanium case giving it a cool and minimalist look that can go perfectly well with the men who live life in the cool as ice fast lane. The crystal mineral glass is scratch proof making it a long lasting watch for many years to come. Overall it is an attractive piece of workmanship that is slim, lightweight and bears a classic look which conveniently matches any look and style. The appealing deep metallic blue dial with exquisite details is well defined with perfectly placed hands and numbers, finely proportioned and crafted to perfection. The fine mesh watch band is robust and therefore highly dependable. Its clasp has a 3-way locking system so it doesn’t open unintentionally. This exquisite looking watch earns worthy top user reviews and ratings from trusted users. Check out each and everyone of these users by clicking the star rating image for this top Skagen men’s watch. Users have definitely appreciated this watch’s versatility as an all day watch suitable for swimming, fishing, biking, hiking or simply working in the kitchen for a quick meal. A perfect gift for that top man in your life, now available for sale at the lowest online store price with Prime Free Shipping options through our offer links. Click to read the in depth latest and Best Skagen Men’s 233XLTTN Grenen Titanium Mesh Watch Review. The Skagen SKW6078 Men’s Melbye Grey Titanium Mesh Watch is another star in the world of Skagen men’s watches. The mineral crystal glass and round gray dial is a captivating feature of this beautiful watch. You will feel confident and well dressed when you wear the silvertone metal mesh band complimenting this beautiful Skagen watch. The blue toned accent used as a track on the dial to decipher the seconds adds to the beauty of this amazing watch. The titanium dial is complemented with day and date windows placed at the 3 o’clock mark. The Melbye Grey Mesh Watch has a well thought out design that makes it a perfect watch for both formal and informal occasions. It is an ideal gifting option for the special man in your life. This watch is a nice timekeeping companion to wear while swimming or showering as it can handle water resistance of up to 50 ft depth. Yet another well reviewed Skagen watch for men which has been highly appreciated by trusted actual users with top ratings. This watch is available for sale now at the lowest online store price with free shipping possibilities through our offer links. 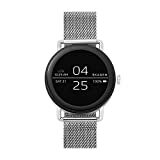 Real user Reviews are available by clicking th star rating button or alternatively click to read an in depth latest and best Best Skagen SKW6078 Melbye Titanium Mesh Watch Review. The Skagen SKW6086 Holst saddle leather watch is itself a treat to watch. Its good looks result from the combination of the gray dial and two subdials, one for a day of the week and the other one displaying the date. The sub dials are textured to create a rythmic feel to the Skagen Men’s SKW6086 Holst Saddle Leather Watch. The indices and hands are luminous to give you comfort in your time-check anywhere and anytime! The Gold Tone calfskin leather is accentuated with a classic Stainless Steel buckle for easy closure. The brown leather band exudes a warm feeling which is pleasantly confrmed with the sensation from touch. This watch can easily be forgotton on the wrist due to its his lightweight and minimalistic design. Just watch your movements since the leather band can be ruined in the rain or near an aquatic location. This watch has all the great features you should expect from a watch of this price with superb watch reviews and ratings from trusted users viewable individually, by clicking the star rating image for this watch. A perfect gift for man, now available for sale at the lowest online store price with Prime Free Shipping options through our offer links. Alternatively click to read the latest and best Best Skagen SKW6086 Holst Watch Review. The Skagen SKW6327 Hagen stainless steel mesh watch is a very traditional and modest looking watch perfected by Skagen’s minimalistic design concept skills. Skagen is the no nonsense brand full of style and timeless elegance. This watch is a wear and forget accessory having the lightweight, classical design and beauty to help augment the confidence and elegance of the wearer. If you prefer big faced watches then this might just be the one to choose from the highly acclaimed collection of Skagen watches. It’s bold and big numbers add an element of depth to this harmoniously designed watch. You will most certainly keep on getting compliments that this watch rightly deserves. Its graceful stainless steel mesh band and a sturdy foldover clasp qualify it into the best Skagen men’s watches. Its great appearance and the accuracy has given this awesome Skagen watch for men top rated user reviews. A perfect gift for him now available for sale at the lowest online store price with Prime Free Shipping options through our offer links. An in-depth review for this outstanding skagen Hagen Stainless Steel Mesh watch review for men is available by Clicking here. The Skagen SKW6082 Men’s Ancher Saddle Leather Watch is in a league of its own. After trying countless other slim and minimalist watches, the Skagen Men’s SKW6082 Ancher Saddle Leather Watch will steal your heart as a trusted new friend and companion. It has a beautiful round white dial that displays the hours in Arabic markers. You can check the current date with a casual passing glance over the circular date window above 6 o’clock. The watch has a blue colored second hand perfectly contrasting its appearance. 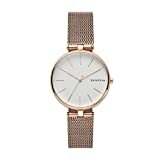 Skagen is a big player in watch industry so with Skagen Hald Steel-Mesh Watch men get a pocket-friendly watch that is sleek, slim and lightweight. The material used to craft this wonderful timepiece is a high quality stainless steel both for the case and mesh watch band. A nice touch from the Skagen is the mesh strap with foldover clasp that comfortably and securely drapes around your wrist. The mesh band features quick release pin and the lug holes are invisible since they are designed on the internal rod of the band. The low price of the watch might easily fool the average watch enthusiast but a quick inspection will reveal the real quality of this cool watch. The Skagen Men’s Hald Watch is of decent quality having quartz movement and analog display with a well-designed appearance. Styled to minimalistic perfection, the Skagen Men’s SKW6187 Hald Steel mesh watch has a sandblasted face containing two alluring sub dials. Arabic numeral and hour markers are featured in a nicely contrasting tone with further added contrast given by the red coloured seconds hand. The watch is water resistant only to 30 m so should not be taken for a swim. The 40mm diameter and only 9mm thickness makes this watch suitable for most wearers. Again we have very good user reviews from trusted top rated reviews. You can go through each individual review for deeper insight into this ingenious Skagen Men’s watch which is one of the most reliable watches in the Skagen watches review list. A perfect gift for him now available for sale at the lowest online store price with Prime Free Shipping options through our offer links. Click to read our in-depth latest and Best Skagen SKW6187 Hald Mesh Review. The Skagen Men’s SKW6278 Hald Steel Mesh Solar Watch is the latest watch in the Skagen Watches Hald collection. It is a technological wonder that does not need to have its batteries replaced as it will operate with daily exposure to light thanks to the use of solar power technology. Each tiny perforation on the watch dial face allows light to reach the solar cell beneath in order to recharge the watch’s battery. In addition to linear indexes and the three-hand movement, the watch dial bears a golden solar insignia. Get a lifetime warranty with this high quality 8 ounce watch with analog quartz movenment featuring a mineral glass dial. The case diameter is 40 mm and the watch band width is 20 mm so it will be suitable for most people. This cool watch is water resistant up to 50m (165ft) so it will be suitable for short periods of recreational swimming. Best not to wear this watch when diving or snorkelling as it might damage the watch. A perfect gift for your man now available for sale at the lowest online store price with Prime Free Shipping options through our offer links. Click here to read more detailed Skagen Hald Steel Mesh Solar Watch Review. Skagen watches are the perfect watch gifts for women with their elegant and minimalist styling. Browse our list of watch reviews to help choose the most suitable watch for the beautiful woman in your life. No doubt she will feel loved everytime she looks to her delicate wrists to tell the time. There is no better feeling for a woman to know that she is dearly loved by her man. Skagen watches are the most brilliant solution for winning her heart with a loving smile. Amazingly Skagen have done it again with their Skagen watches for women collections helping so many women with affordable elegant sophistication and glamour gracing their wrists. Skagen is a mind blowing success story. An excellent choice and perfect gifts for lovers. 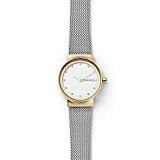 The Skagen Women’s Freja Steel mesh watch is one of the best examples of minimalist watch design with an elegance that can only be experienced by wearing it in all occasions and outfits. It has a stainless steel case giving it a solid appearance. The dial shows numbers at 6 and 12. The rest of the numbers are denoted by small and simple metal disc shapes which look elegantly beautiful and unique. The Stainless steel mesh band completes the designer look of the watch with a seamless integration of the watch body with the watch band. With an enhanced water resistance, a degree above other Skagen watches, you can enjoy swimming, surface diving or showering wearing this watch. The two stage clasp secures and fits to your wrist so that you can relax and move about without any worry. It is extremely lightweight to wear and so comfortable that you will almost forget to remove it at night. Its dark colored dial is an excellent feature. 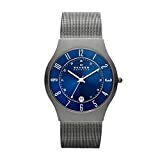 The color contrast of this watch is a good reason for the top rated user reviews viewable by clicking through the star rating image for this stylish watch in the product box. A perfect gift for her, now available for sale at the lowest online store price with Prime Free Shipping options through our offer links. 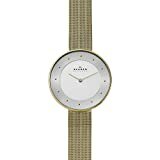 In case you would like to see a more detailed Skagen SK2666 Freja Mesh Watch Review click the link. 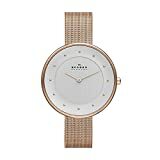 If you want something luxurious within an affordable budget then the Skagen Women’s 358SGSCD Freja Stainless Steel Mesh Watch qualifies as one of the most suitable candidates. It has a regal appearance with its round gold-tone case and complementing lugs. The white watch dial is the perfect background for checking the time, displayed with twelve crystal hour markers. It is an easy to read watch that can be worn for any formal or semi formal occasion. The stainless steel mesh band adds a sleek and sturdy structure to the watch. It can be easily secured on to the wrist using the fold-over push-button clasp. Once locked into position, it will not open accidentally. It is not recommended to be worn while swimming or surface diving as it has water resistance only up to 30 ft. It has a mineral glass window that can easily withstand a light splash or a light rain shower. This lovely watch has a great following backed up by a large number top rated user reviews. These reviews can be examined by clicking the star rating image for this watch in the product box above. This Freja watch is a perfect gift for the beautiful woman in your life now available for sale at the lowest online store price with Prime Free Shipping options through our offer links. Click the following link to read our in-depth latest Best Skagen 358SGSCD Freja Watch Review. Here we have a beautiful example of glamorous silver watches for This Skagen mesh and glitz women’s watch is made from a silver tone metal, hardened mineral crystal glass and crystals embedded at the hour markers. Its stainless steel case is complemented with the stainless steel mesh band that is adjustable to fit all sizes. You don’t have to look for an expert for Skagen watches to remove links for the perfect fit. The Skagen Women’s SKW2142 Gitte Rose Gold Mesh Watch is a great example of the beauty of elegant oversized watches. The elegant rose gold-tone having the signature minimalist design. The dainty white dial is embellished with round-dot golden hour markers and rose gold-tone hour and minute hands. This queen of oversized watches is a secure and shout out aloud watch manufactured to the usual Skagen quality standards with stainless steel case and extra hardened mineral glass. This watch is an excellent piece of ornamental artistry giving you the satisfaction of having a scratch-proof surface, likely to last for many years to come. The Skagen waterproof watch standard also applies here with water resistance up to 100 ft or around 30m so everyday activities can be handled easily. Its rose-gold mesh band adds to the timeless class and elegance of this fabulous women’s watch which is effortlessly locked into position with a fold over push-button clasp. It’s a great watch to add a spark of glamor to a formal dress up or a top professional look for the workplace. It is an inexpensive and very affordable watch with a sophisticated and exotic look. The hard wearing durability of the watch is a typical feature of Skagen watches. Yet another popular Skagen ladies watch with lots of top rated user reviews viewable by clicking the star rating image for this watch. 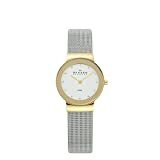 This stylish and reliable Skagen watch for women has been well accepted and reviewed by satisfied users. A perfect gift for women now available for sale at the lowest online store price with Prime Free Shipping options through our offer links. Also available to view with our in-depth latest Best Skagen SKW2142 Watch Review. If you are not one of those who prefers purely metal watches then take a hard look at the Skagen Women’s Anita Watch. It is made with stainless case and elegant looking soft brown leather calfskin band. The buckle closure secures it to your wrist allowing you a sng fit as required. 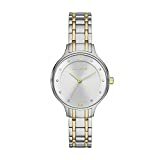 The Skagen Anita watch is one of the slimmest models offered by Skagen, with clean lines that look contemporary and stylish, fit for any kind of occasion. It will fit perfectly with party wear dresses as well with a business suit as well as to add a sparkle to casual wear. The face of the watch is a bit on the larger side with regards to size and can be classified in the oversized watches niche but the saddle leather band balances it well to give it a graceful look and feel. With a water resistance degree only for mild shower or splashing, the leather band holds well even if it gets thoroughly wet. It retains the original soft and supple texture and the sheen. A nice quality ladies Skagen watch with stunning good looks and a nice following of satisfied customers with top rated user reviews. A perfect gift for the women in your life, now available for sale at the lowest online store price with Prime Free Shipping options through our offer links. We also have a new in-depth Best Skagen SKW2147 Anita Watch Review available only a click away. The Skagen SKW2145 Anita Sub-Eye Leather watch is a professional looking watch with a white dial face and a leather band in white color. It is a star watch from the Anita collection that is water resistant up to 99 feet. This watch is a beautiful, lightweight and a slim masterpiece for Skagen watches. It has an original style typical for all Skagen watches. The curved crystal face of this watch helps to bring a sparkle to your day with its timeless appeal. This is a well-proportioned watch which will keep getting you compliments all day long. Its falls in the category of luxurious looking fashion watches available at an affordable price. It has the capability to wow you with its flawless craftsmanship and seemingly timeless design. All those wonderful ladies with delicate wrists will adore this medium sized beautiful watch. It is an easy to read watch with Australian crystal hour markers with 12 and 6 hour numeral markers. Plenty of nice top rated user reviews for this stylish and very affordable watch. Check out the verified user reviews by clicking the star rating image for this watch. A perfect gift for your woman or lady friends, also now available for sale at the lowest online store price with Prime Free Shipping options through our offer links. Furthermore we have an in-depth latest and best Skagen SKW2415 Anita Watch Review. A truly Danish watch in terms of design and appearance, the Skagen Denmark watch for women aka Anita Watch has a remarkable feature that enhances its appearance to a level of perfection. The watch looks like a classy bracelet with a double tone metal link band and a complementing clasp. The round shape has a sunray dial which looks quite chic with raised outer dial. The hours and minutes hands are gold-tone moving along ten crystal hour markers. The dial has only two numbers 12 and 6 giving it a simple and elegant look. The mineral dial window glass is robust enough to handle all kind of use and abuse. It protects against scratches and unavoidable knocks from daily life. You can wear it all the day without the hassle of taking it off even when there is a little water involved. This watch cannot handle waters while diving or swimming, so best to avoid such situations. This beautifully elegant watch is one of the best offers from Skagen scoring high with user reviews which can be viewed by clicking the star rating image for this watch. A perfect gift for your intimate lady friends and wife now available for sale at the lowest online store price with Prime Free Shipping options through our offer links. In addition click to read an in-depth latest and Best Skagen Anita SKW2321 Watch Review. Get this wonderfully round and queen of oversized watches with a dual layered silver dial and dot markers that look just like a large sundial on a golden bracelet with the elegance of perfect design proportions. Its super hardened mineral dial window is scratch proof and waterproof but only for brief splashy moments of enjoyment in water. Its golden steel mesh band is sleek, fine and comfortable to be closed with a fold-over push-button clasp safety closure. This is a bright looking watch that is capable of adding a welcome sparkle to your days and glitzy glimmer to your nights. It has that perfect touch of class that makes it a versatile watch to wear for any kind of occasion and for as long as you wish. It is so lightweight that unless someone compliments you on its brilliance you might forget you are wearing it. The unique look created by the touch of gold and silver makes it precious and appealing. This type of ladies designer watches can be worn by those who love golden watches as well as those who love those trendy ladies silver watches. This watch has many verifiable top rated user reviews which you can see below by clicking the star rating image for this watch. A perfect gift for her now available for sale at the lowest online store price with Prime Free Shipping options through our offer links. Also Click to read the latest and Best Skagen SKW2141 Watch Review. What is the History of Skagen Watches? The Skagen watch concept has been inspired by the Danish coastal town of Skagen as well as Scandinavian styling. The founding couple Henrik and Charlotte Jorst decided on establishing their own business in 1989 selling business watches as gifts. Initially starting off manufacturing watches through a factory in Hong Kong, the Jorst’s started designing their own watches and started showing them at their first trade show in 1991. It was a dream come true with sales taking off from day 1 accumulating sales revenues in the first year of $800K. The next five years witnessed exponential growth as they hit $30 million in sales revenue in 1997. All this was achieved in between whilst they hadn’t formally hired any employees. As business continued to boom high flying professionals were hired and in 2005 the Jorst’s relieved themselves of daily operations to focus solely on top quality and innovative Scandinavian inspired design. Consequently by 2011 the business was able to penetrate and capture a decent market share in a global marketplace. The remarkable growth of this watch company with its explosively high- trending figures was acknowledged by The Fossil Group who in 2012 bought out shares of the Jorst’s and some of their partners for a whopping $225 million as well as allocation of 150.000 shares of Fossil Group common stock to them. Thus Skagen watches became a wholly-owned subsidiary of The Fossil Group. Skagen watches rose from humble beginnings to now a truely global operation with outlets to be found in over 60 countries as well as being easily available online with fast hassle free shipping to almost any destination. Furthermore Skagen not only create watches but also tech wearables, jewelry and leather goods with styling driven by their guiding principle: Good design for better living. This results in focusing on simplicity and capturing only what’s truly essential in an uncomplicated and great-looking way. What do watch forums say about Skagen watches? Overwhelmingly most of us would agree that the design element of Skagen is top notch for its price category, whereas the chinese movement may let-it-down in between. Watch forum comments about Skagen watches also here and here. You can also see the Reddit Skagen watches reviews by pressing the link. Here is a watch forum link for many Skagen forum watch reviews bear testimony to the good name of the Skagen watch brand. In fact when Skagen is compared to MVMT and daniel Wellington watches it does rather well. Where are Skagen watches made? Make no mistake, yes those cool minimalist watches from Skagen are designed with Danish design principles, the watches themselves are made in Hong Kong from globally sourced components. Skagen watches are currently are manufactured benefitting from the ability of the Fossil Group to leverage costings using combined group economies of scale. The bottom line is that many of the watches are manufactured and assembled in China but feature Japanese Miyota quartz movements. However some Skagen watches do that have Swiss movements and components achievable through Fossil Group’s Swiss-made watches operations. How is the Warranty of Skagen Watches? Amazingly the Skagen watch brand is able to offer a limited international lifetime warranty on their watches. The warranty covers internal movements of their watches, the hands, and the dial. The external components of the watch are not included in the warranty, nor so the strap or band. There may be charges for repairs that need to be done for issues that do not involve faulty materials, workmanship or handling. Buyers based in California are excluded from the postal charges. Obviously a valid sales receipt is required in order to make a warranty claim. Details can be found on the Skagen warranty page. Further details can be obtained from the email: skagen@skagen.com US customers can contact customer service at 1 (877) 752-4361. What’s the Price range for Skagen Watches? Most Skagen watches will normally retail from around $70 to $400 with fluctuations from retailer to retailer. Department store purchases like from Macy’s and Bloomingdales may add another 10-20% to the MSRP of the particular watch. Do Skagen have Smart Wearables tech watch fitness tracker technology? The Skagen watch collection also has the latest and best wearables tech features incorporated in their hybrid smart watches and fitness tracker devices for sportsmen and sportswomen alike. Also nowadays tech wearables watches are most sought after by fitness enthusiasts and runners. These tech wearables have grown in popularity as they can also be designed like fashion accessories to complete a fashion statement and look. Are Skagen watch bands inter-changeable? Skagen offers interchangeable watch straps including various metallic and leather bands also available in a variety of colors. If you like a sturdy band, get a metallic band watch as it relatively easier to clean. The metallic band watches go well with professional outfits. Buy a leather band watch if you are more of an outdoors, sports or casual person. Before going ahead with purchasing a new Skagen watch, let’s look at some of the features to compare these contemporary watches in order to select the best one for you. Skagen offers a variety of colors of Skagen watch dials. If you are buying the watch to wear at your workplace or for professional endeavors, look for a decent dial color like white, black or gray. But if you have to wear it for other formal or informal occasions, you can try blue, brown and other trendy colors. You also can choose from the shape of dial face like round or square. Skagen vary in how the time is indicated. It can be un-numbered or marked with small metallic bars, crystals or metallic type drops or discs. Some watches have numbers at two, four, ten or all twelve places. The basic idea is that Skagen are very innovative in creating an awesome style of markers in every watch they produce. It is totally up to your preference, comfort and style. Sleekness: How slim are Skagen watches? A sleek watch has many advantages. They are more appealing if you are not fond of those bulky heavyweight watches also trending these days. Check out a sleek minimalistic Skagen watch that slips conveniently under your shirt cuffs without making you feel uncomfortable. Weight: Are Skagen watches lightweight? The wrist is a delicate body part that carries the weight of a watch. If you work for long hours, why not select a lightweight watch so that your wrist does not have to bear the stress of a bulky watch? Bezel: Do Skagen watches have a bezel? You can also check out Skagen watches that have a bezel. It is a ring located at the top side of the watch case if you want to do some activities that involve time keeping or recording the time elapsed in an activity. You can select from static, unidirectional or bidirectional bezel according to your need. Luminous hands for dark/night: Are Skagen watches good for evening wear? For adventurers and explorers moving around in darkness is an essential part of outdoor activities. They need accessories that support their adventures irrespective of the time of the day. So, if you too have such requirements buy a Skagen watch with luminous hands, hour marking or numbers. Read the individual product reviews to see what are the most suitable options available. Closure: What type of closure do Skagen watches have? A watch closure is an important aspect since it defines the comfort of wearing a watch. Choose the one which you can conveniently close single-handedly. The options are usually a Buckle or a Two-fold clasp mechanism. Customizable to fit: Are Skagen bands easily adjustable? We strongly recommend a watch that fits you perfectly. If you select a watch with the leather band then it can be easily adjusted to fit your wrist. But if the watch you wish to buy is metallic or stainless steel, then ensure that you get it customized to fit your size. It can be done by readjusting the clasp or by removing one or two links. If your chosen model does not allow this, select a watch tat fits perfectly well from the start. Date /Calendar: Do Skagen watches also have a calendar for date and time? If you don’t rely on your mobile for scheduling appointments and meetings then you definitely need a Skagen watch with date or calendar. Choose a model carefully since all Skagen watches do not offer this feature. Size of dial: What size watch dials to Skagen use? It’s an age of big and heavy watches that look robust and say a lot about the wearer. But if you are considering buying a Skagen watch, you will get a range of slim and sleek watches with medium sized dials. Skagen waterproof watch: Are Skagen watches waterproof? Almost all watches from Skagen water resistant but to varying degrees of protection. Consider the kind of recreational activities you enjoy and the kind of weather prevailing in your city. Select a Skagen waterproof watch with a suitable water resistance capability. Ease of cleaning: How easy are Skagen watches to clean? You should be able to clean the watch will least efforts and accessories. The cleaning process must be simple to follow without any risk to your purchase. What is the Skagen watch Price range? Of course keeping your budget in mind is the most important aspect of any purchase. Skagen offers a wide range of affordable luxury fashion watches including the latest Wearable Tech and Hybrid Smart watches. Prices range from around $50 to around $400. Anyone who stresses much upon quality will of course compromise a little to the very affordable Skagen watch price too. How to take care of your precious Skagen Watch? Whenever your Skagen Watch battery needs replacement, you can get it done from a jeweler or a Skagen retailer. Just ensure that you get a battery replacement as per the recommendation for your Skagen model. Keep the watch crown in its normal working position before your watch comes in contact with water. You can enjoy a relaxing hot bathtub or sauna, but your Skagen watch doesn’t. Take it off your wrist before you hit your restroom. Take your Skagen watch to an authorized Skagen watch service center after every 3 years and get its seals replaced. It is essential so that you can enjoy different locations and weather wearing your cherished watch. Know your Skagen watch thoroughly and wear it according to the recommended water resistant capability of the watch. Clean the watch / band with four parts of Ammonia and one part water. Avoid all kinds of soap products or harsh chemicals usually suggested for other accessories. You can also use a solution of Ammonia based window cleaner and water in the ratio of 4:1. These solutions evaporate immediately, so your watch will remain clean and dry. Don’t soak your watch in any of these solutions. Skagen Watches are reknowned for their exceptional and highly acclaimed and distinctly distinct Danish Design which in itself can compliment and highlight your personality and feeling of wellbeing. The good quality of the watches in relation to the watch price will ensure that the watch can easily last around 3 years of normal wear and tear. This is quite reasonable bearing in mind that the Skagen brand is more often compared with fashion watch brands. To learn more about each individual watch click the product link to view the user reviews and specs. It is evident from the above that the Skagen brand and its team are intensely passionate about good design being the essence of producing contemporary and cool fashion watches. The minimalist Scandinavian design roots helps to shape their aesthetically clean, uncluttered and streamlined design. Skagen’s less-is-more approach means that they are more likely to edit than to embellish. They do not see it as taking away, it is more like addition by subtraction. Skagen’s understated products really do look right at any time of day, anywhere in the world, whether now or in 5 or even 10 years time from now. Simplicity isn’t just beautiful, it transcends time to become in essence timeless. The versatility derived from Good design is more than just good looks. It is celebration of life in an empowering way. For the Skagen watch brand, form and function aren’t mutually exclusive. They believe that they go hand-in-hand and therefore inherently linked. A clean and uncluttered watch dial can be read with a passing glance. A Slim case means less bulky weight and even less probability to catch on your sleeve. The analogy goes that fewer pockets on a bag effectively mean less time spent searching for your keys. In everything Skagen create, their goal is the same: to make life simpler —better—through purposeful design. Skagen watches have been a revolution in the world of contemporary fashion watches with there range of super elegant, slim watches designed using principles of minimalism and excellent styling. The sleekness of these watches has not compromised the accuracy, appearance, and practicality. There is a perfect Skagen watch for everyone out there. Just take out a little time to compare our review for each suitable product. It would be also beneficial to visit online stores like Amazon prime via our links before buying a Skagen watch. The Skagen watches brand quality is what one should expect from an affordable fashion watch with luxury undertones. Shortlist your favourite Skagen watches in order to make an intelligent purchase for yourself or a loved one. The Skagen watch brand is known for its cool and minimalistic designed watches as well as being a premier fashion accessory. We thank customer reviews for hands-on feedback for our review site at WatchiWatches. We will from time to time add new styles and models to the Skagen product reviews which will be continually updated. In depth Skagen reviews can be found by pressing the corressponding links. Watchiwatches is the best watch review site with customer reviews and newly introduced Tech Wearables with GPS Fitness and Activity Trackers is an inspiration for others to follow. Plenty of Best Selling and Trendy Gifts for Lovers available for sale with the lowest online prices!